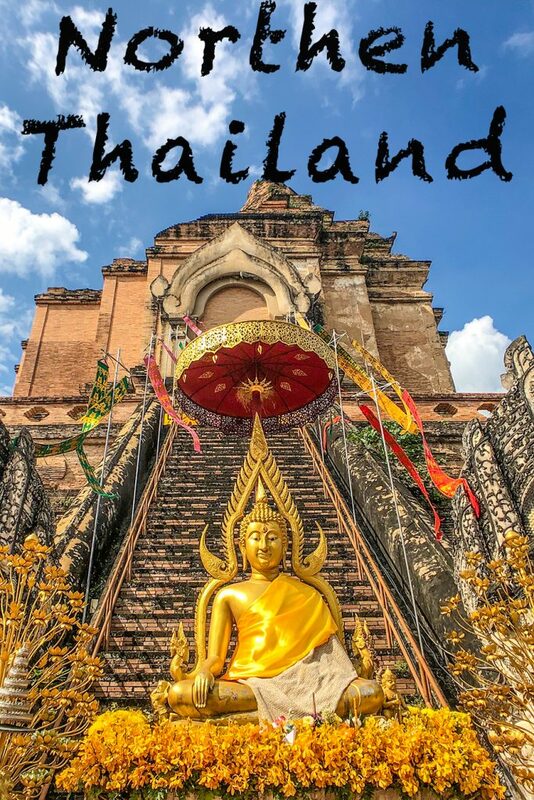 Since we could stay just 2 weeks in Thailand with Visa On-arrival, we had to plan very well what to see. 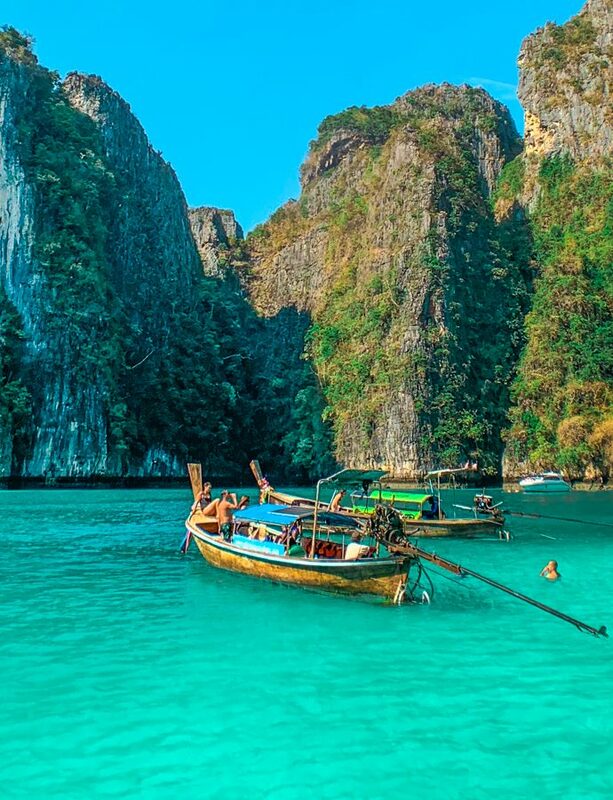 Initially we thought to fly to Phuket from Bangkok, as this is the most famous beach location in Thailand. 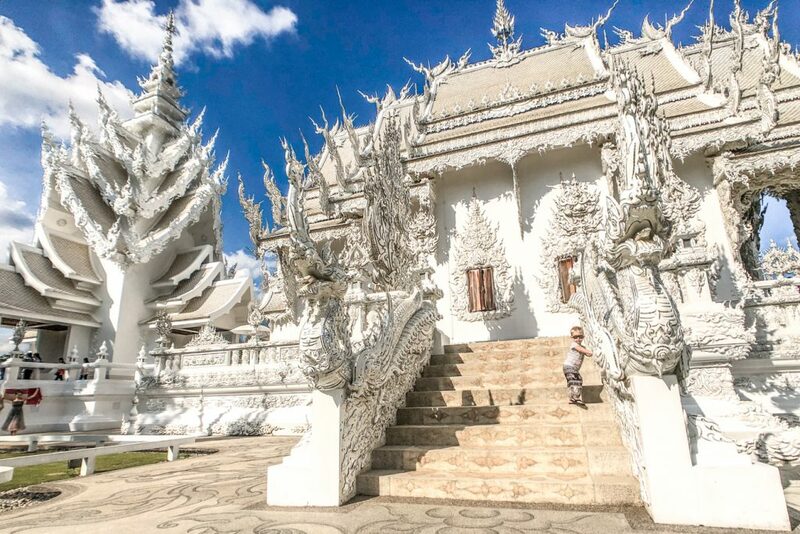 But after a more thorough research, we understood that Thailand is much more than islands and beaches. If we wanted to see a more authentic side of the country we should be heading to northern Thailand, and so we did. 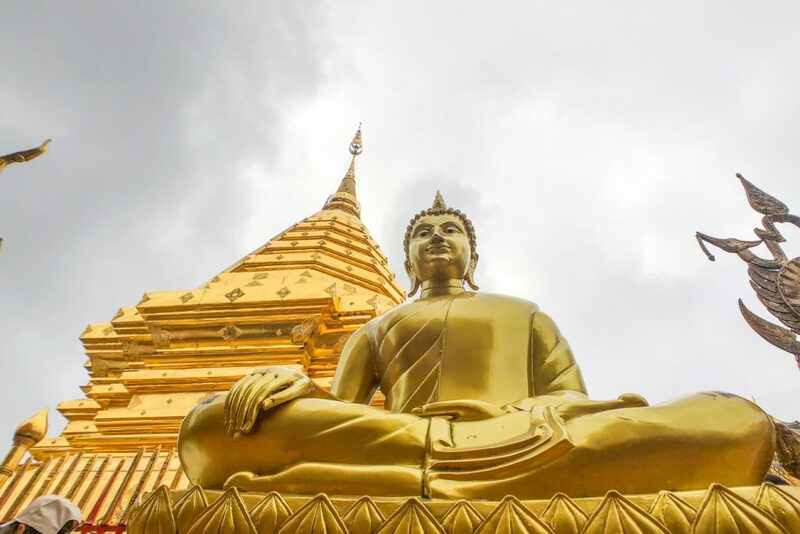 Just a short and cheap flight away from Bangkok, Chiang Mai is the starting point to explore the northern side of Thailand. 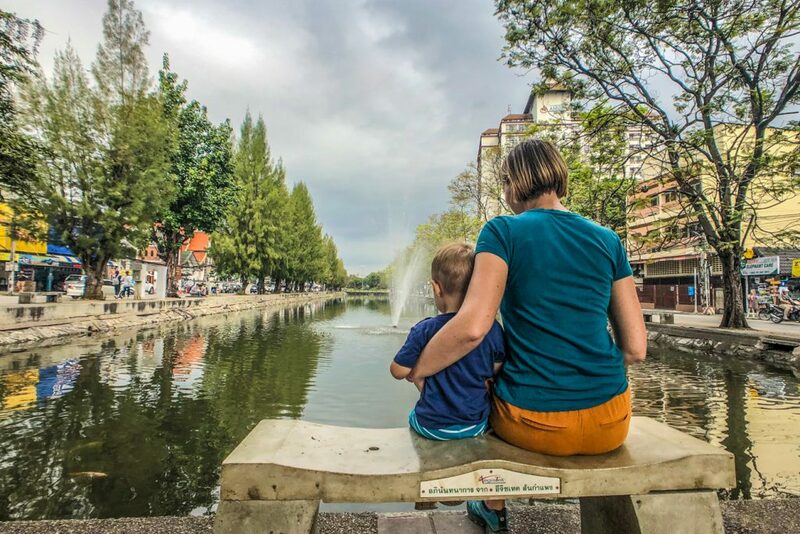 Chiang Mai is a very tourist friendly city. The gated city is quite small and walkable. You will find here plenty of options to spend your time, for every taste and budget. 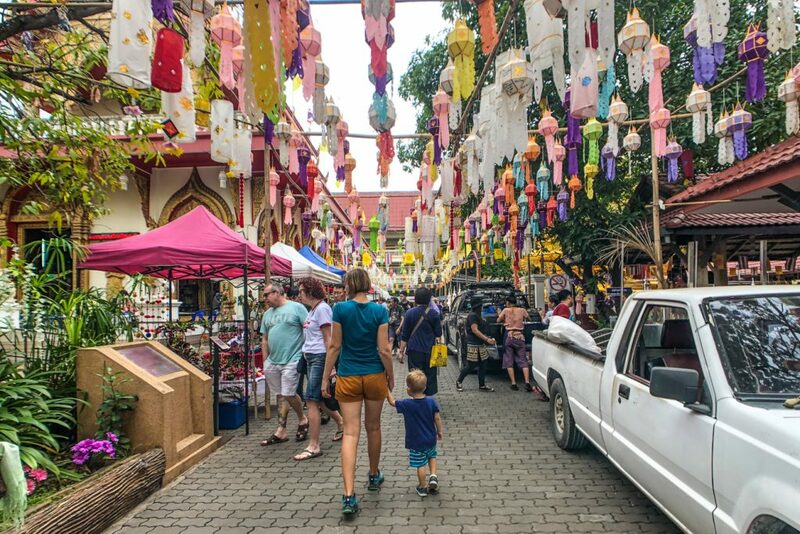 Thai or international restaurants, bars, traditional massage centres, street markets or chic souvenir boutiques, you’ll find them all in Chiang Mai old city. 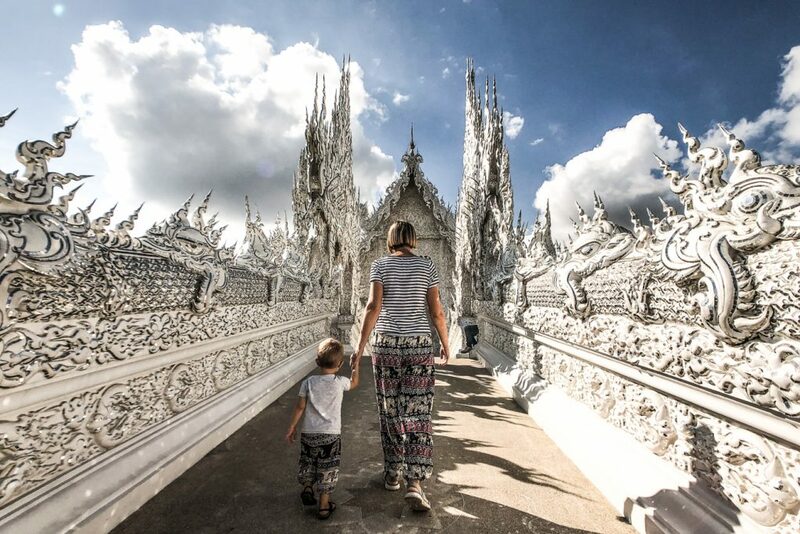 We could easily walk around, even though we were in Chiang Mai with a young child. 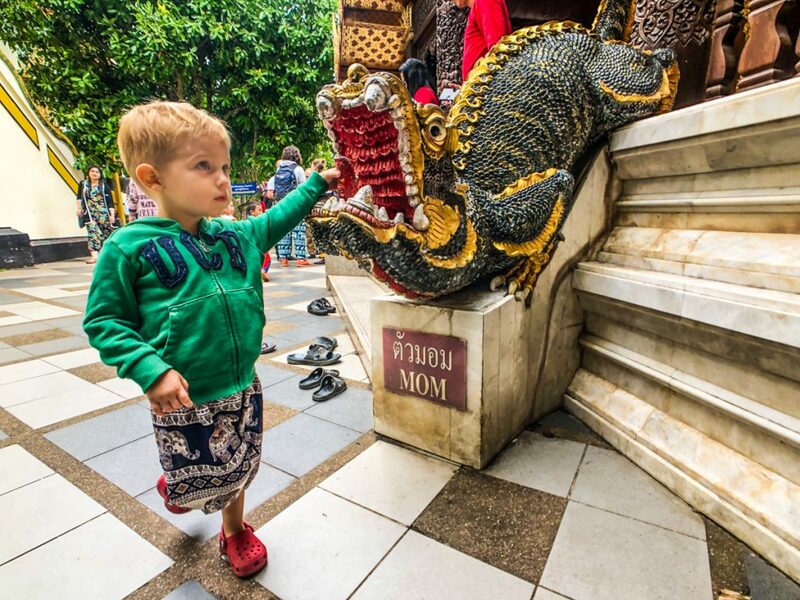 We’ve actually seen lots of families with kids in during our stay in northern Thailand! For Eric, the favourite place in the city was Tha Phae Gate, the eastern gate of the old city. Here there is a large pedestrian plaza, a popular meeting point, where hundreds of pigeons fly around. Kids were having a great time running after the birds, while adults were trying to catch the best shot on their phones. 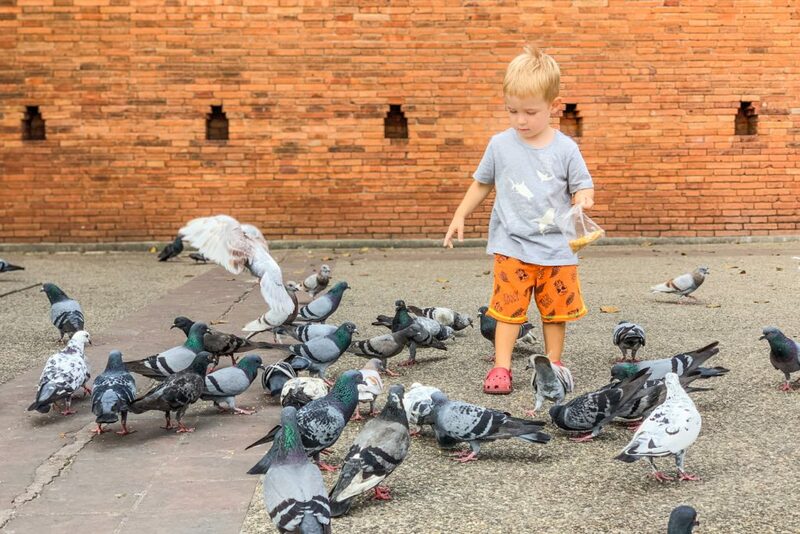 Even though there were a few signs warning not to feed the pigeons, lots of street vendors were offering kids small bags of seeds to attract the birds. On the same spot, one late afternoon, when the birds were already gone, Eric loved watching a badminton game played by locals. It was one of the few times when he was patiently watching something for at least 10 minutes, just giggling when one of the players made a mistake. So I know another sporting stuff to add to the gift list for the next years! 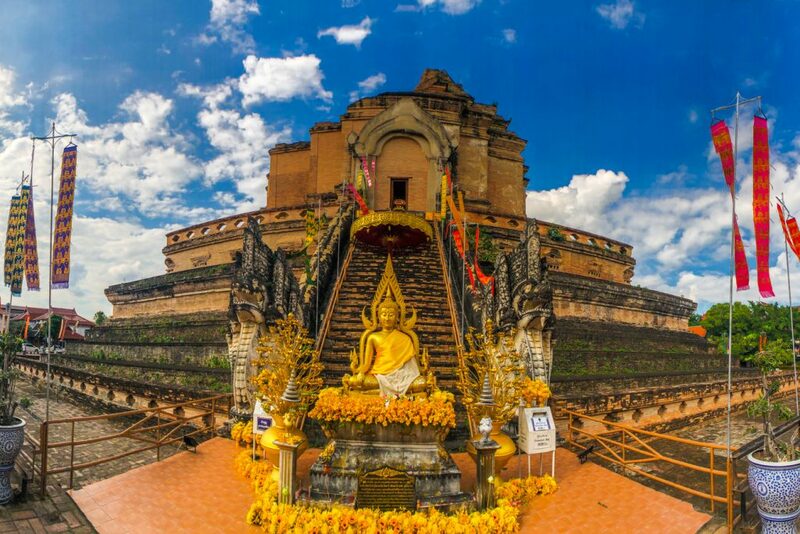 Wat Chedi Luang – The biggest temple complex in Chiang Mai, it features a large pagoda dating from the XIV century. Even though the structure was highly destroyed by the passing of time and earthquakes, it is still impressive. Inside the premises there is also the Pillar City Shrine, the center of the old city. Once considered the epicentre of the world, even in present times only men are allowed inside the building. It was difficult to explain Eric such rules! I doubt he understood, but he had to accept that “mommy can’t go”. 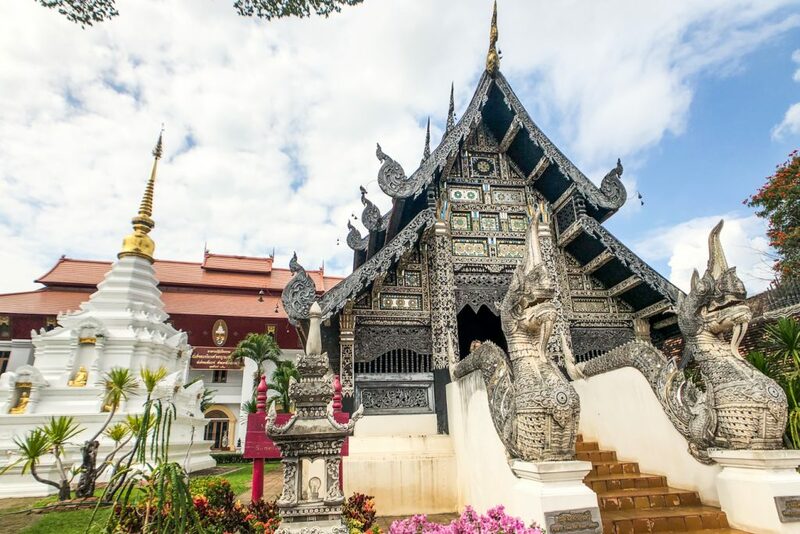 Wat Phan Tao – Right next to the more famous Wat Chedi Luang, Wat Phan Tao is one of the few wooden temples that can still be found in Chiang Mai. Eric enjoyed a lot its large garden and the bells lined up on a side. 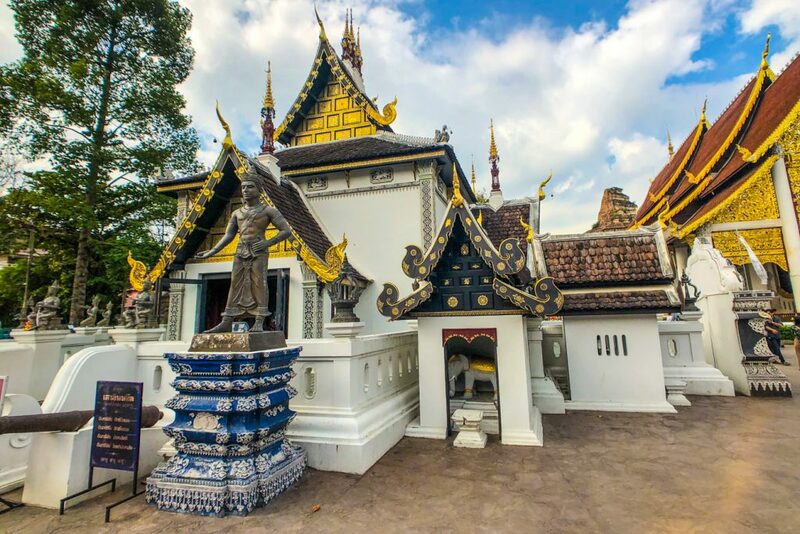 Wat Phra Singh – Probably the most impressive of all, Wat Phra Singh hosts a famous Buddha statue, along with fine carvings and an important library. 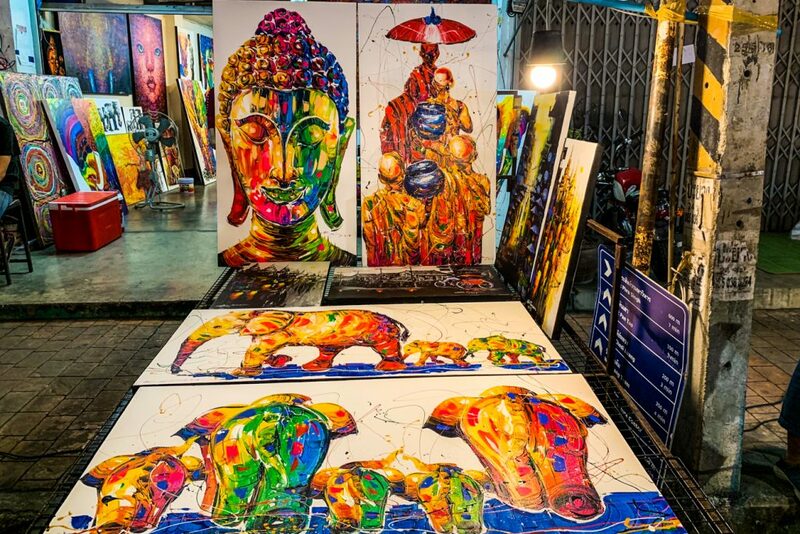 The night markets are one of the best experiences when you visit Chiang Mai. Some people say they are one of the best in Thailand, but I did not checked enough (yet) to make an opinion. 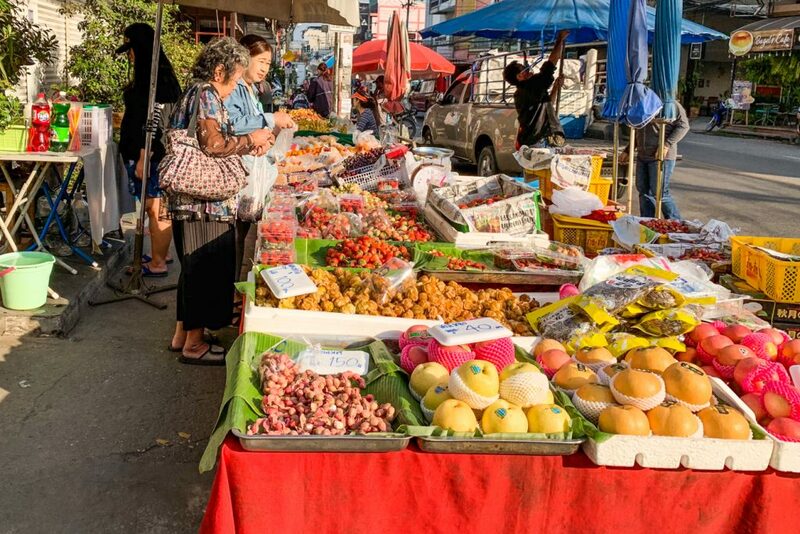 Since our trip to Chiang Mai was around New Year’s Eve, the street markets were very crowded and with a very large offer. From art and crafts to fruits and tasty treats you can find here anything you want. I felt so bad there was no space in our backpacks for any handmade products, as in Chiang Mai street markets you can find amazing artistic stuff. They are the perfect place to buy souvenirs and small gifts! Still, no matter how much I liked to admire the offer, Chiang Mai’s Street Markets are not the place where to go with a young kid. Eric got bored very quickly and he was very agitated by the crowds around him. 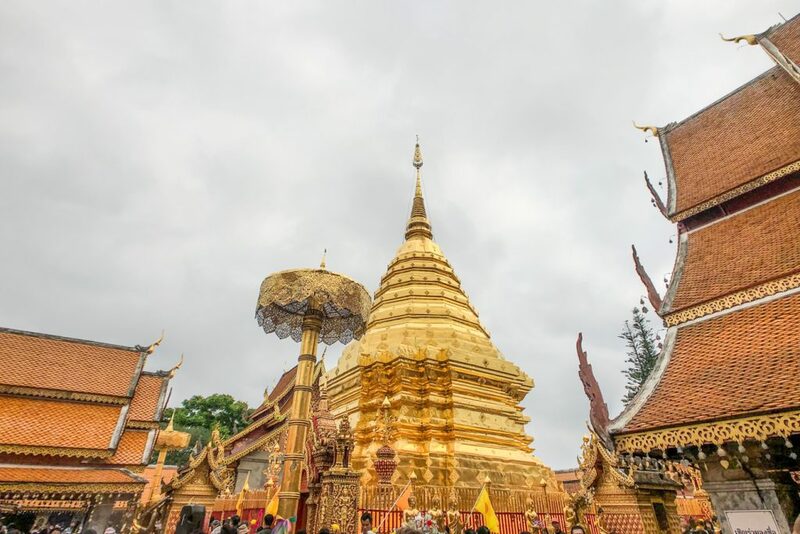 Typical day trip destination from Chiang Mai, Doi Suthep should not be missed when you visit Northern Thailand. Most people know just the temple located here, but the mountain also hosts the Bhubing Palace, the winter residence of the royal family. Further away there is a National Park with various trails and gorgeous landscapes. Just 15 km away from Chiang Mai, getting to Doi Suthep can be a real challenge, due to high traffic and the winding mountain road. It was extremely crowded on our way up and it took us more than an hour. Luckily, at return we were in the city in 15 minutes. We chose the most popular and cheap way to get to Doi Suthep, using the red songthaews. They leave from Chiang Mai zoo with no fixed schedule, as soon as they have at least 10 passengers. You shouldn’t have to wait more than 15 minutes for it! For a larger group, you can “charter” one to take you up the mountain straight from the city and even wait for your return. 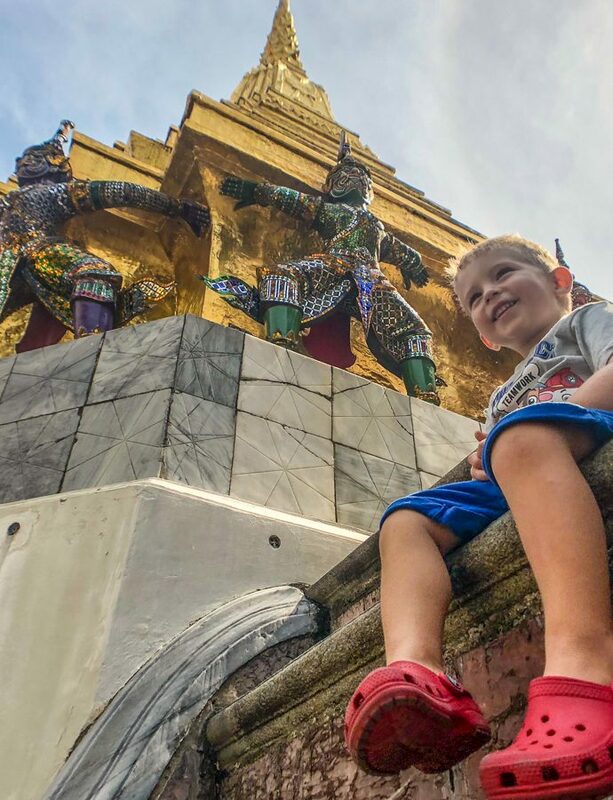 Wat Phra That Doi Suthep, the temple located on the mountain, is one of the most important in Thailand. It took us a while to get to the top, as Eric wanted to do climb the stairs by himself. But there was no rush anyway! The temple is quite large, in the typical northern Thai style and it was very crowded when we visited. 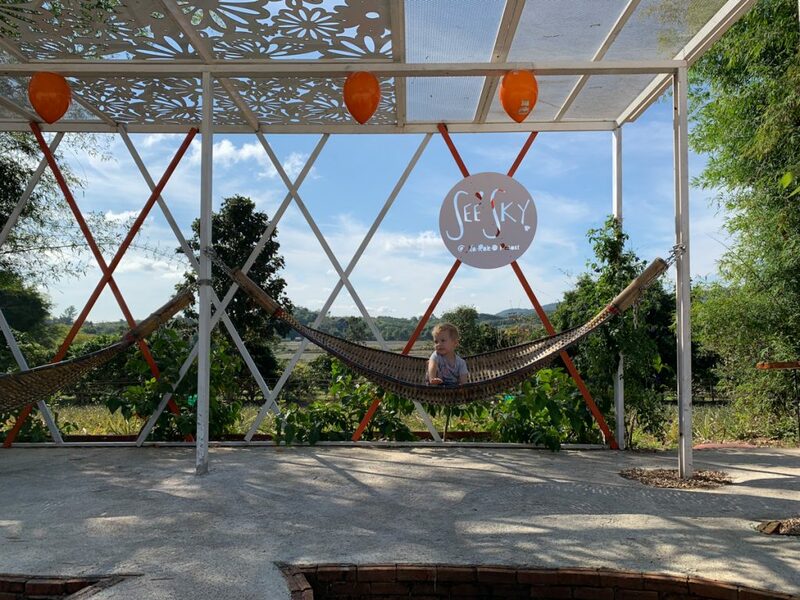 Make sure you get to the terrace too: the views towards Chiang Mai are stunning! I highly advise you to stay in Chiang Mai in the old town or at least very close by. 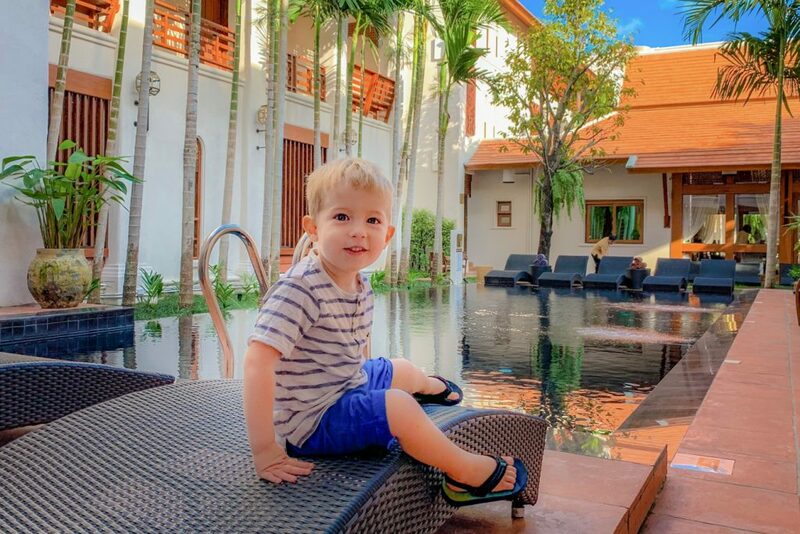 We spent our time at Phra Singh Village, a new hotel right across the street from the temple bearing the same name. This was the perfect location to explore everything the city has to offer. We were welcomed at Phra Singh Village with a cold drink, a tea that was changing its colour when mixed, through the amassment of our kid. He kept asking for a few days if we can have again “the tea that turns purple”. 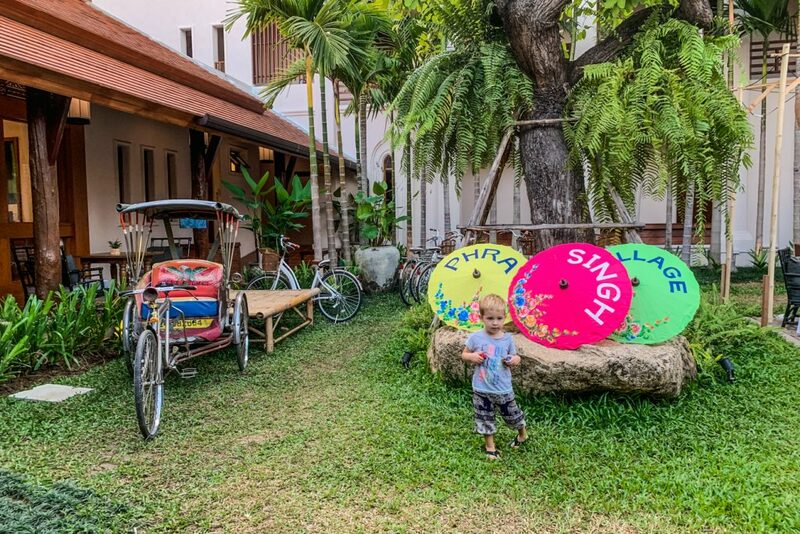 The family rooms at Phra Singh Village are perfect even if you have a larger family or older kids. Very spacious, they also feature a kitchenette and a balcony facing the mountains. The big hot tub with jacuzzi was another awesome point for Eric. 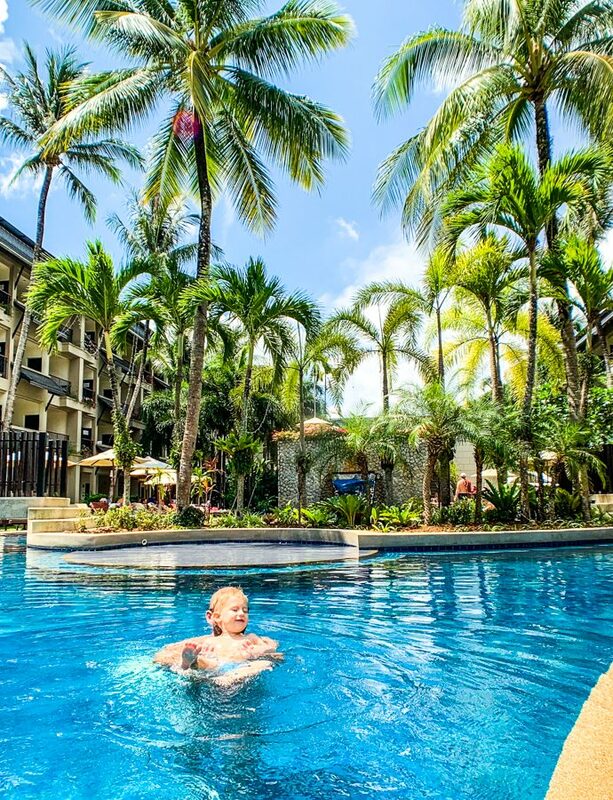 It was the first time he experienced a jacuzzi and we could hardly take him out of it! For me, the best moment at Phra Singh Village was enjoying a neck massage one afternoon, while my boys were having fun by the pool. Breakfast at Phra Singh Village was delicious! We could choose from a large variety of local or international dishes and sweets. Also, it was one of the few places we’ve been to have kids tableware at the buffet, next to the regular ones. It makes a huge difference when the little ones are treated equal to adults! 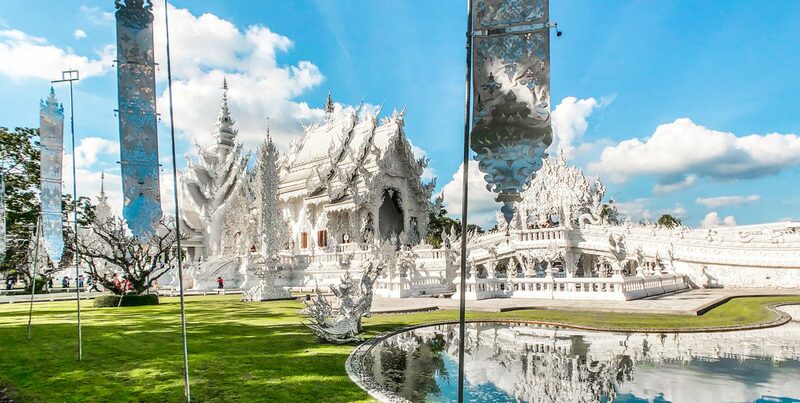 There’s much more to do in northern Thailand besides Chiang Mai. 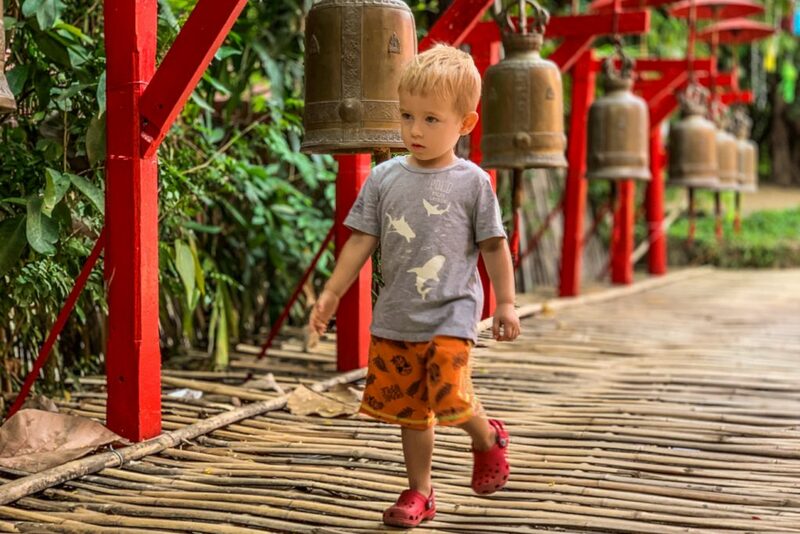 But we did not wanted to get very tired traveling too much around the mountain area of Thailand with a toddler, as our time was limited. Still, we managed to make a 2 days trip to Chiang Rai which we highly recommend. 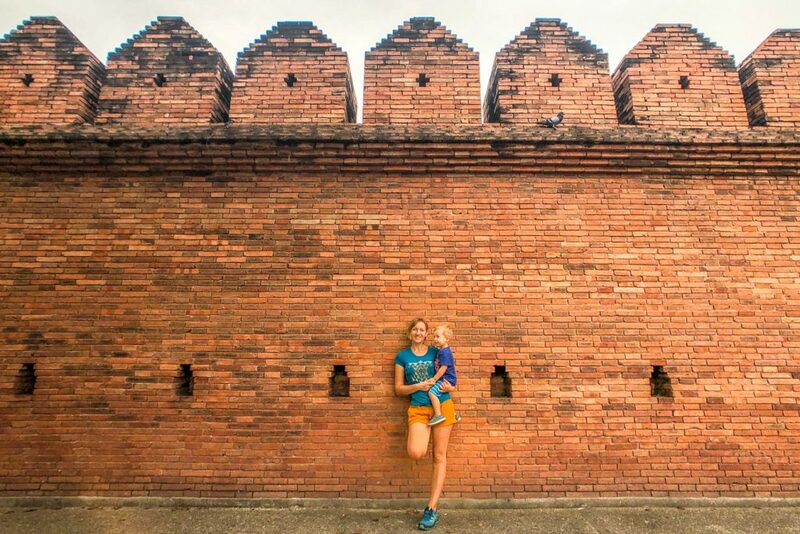 Not so developed in terms of tourism, in Chiang Rai you get a great mix of history and modern culture, visible in the architecture all around the city. Unfortunately we did not get to see everything we wanted in Chiang Rai, as I got some stomach issues – too much spicy Thai food perhaps. It was nothing serious, but still I was not feeling like doing anything for half a day. So the Black House and the Blue Temple remained for the next time, as northern Thailand is one of the few locations where we plan to return. 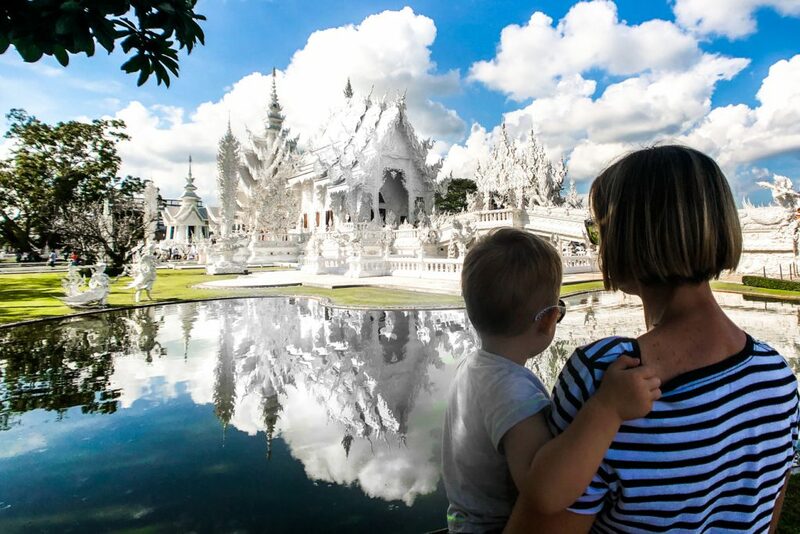 What we managed to see though was the White Temple (Wat Rong Khun), famous for its unconventional architecture and symbolism. You must see it yourself, it is fascinating in ways that cannot be described or understood from pictures! 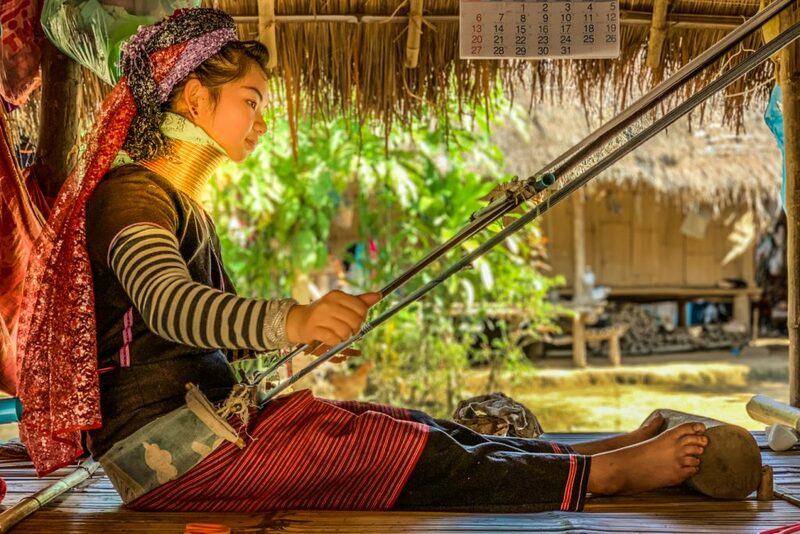 One of the most controversies around Chiang Rai is visiting a village of the Karen tribe, nicknamed “longneck” after the neck rings worn by its women. We had some thoughts about it and did an extensive research, as lots of people raise ethical issues and call them “human zoos”. In the end we decided to pay them a visit – not in an organised tour, but based on our hotel host guidance. Since the village was very close by our accommodation, she could explain us a bit of the tribe background. She even introduced us to one of her gardeners, who is member of the tribe. So, among other stuff, it is not at all true that the tribe people are not allowed outside their village! The entrance seemed a bit expensive, but at least it was for the tribe benefit! We walked around the little village, without being too intrusive around the houses where people were doing their regular work, without being disturbed by our presence. We spent most of our time in the market area. Here, women were knitting, weaving and selling various hand made souvenirs. We bought some beautiful scarves, asked for a few photos and Eric started to play with the kids… I am again amazed how children can overpass all the language and cultural barriers! 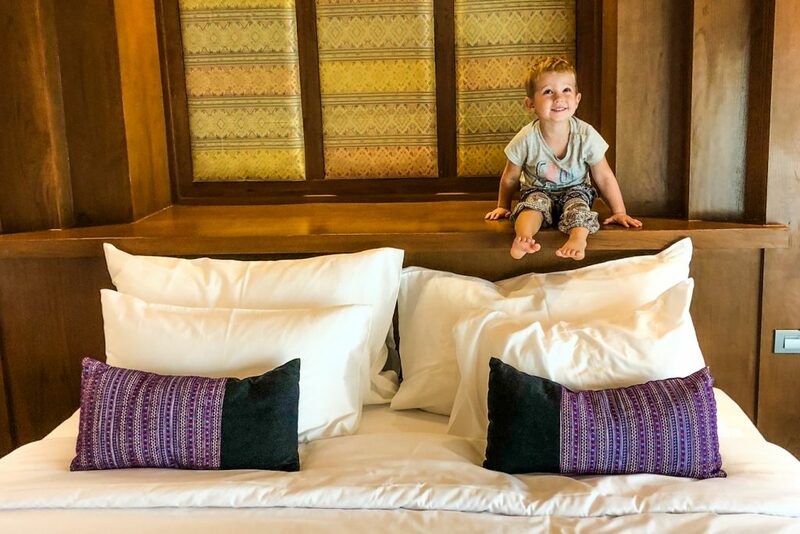 The accommodation we chose for Chiang Rai was probably the all-time favourite for Eric! I guess any kid loves tents and all the adventure associated with sleeping in the nature. On the other hand, I am not at all then camper-type and neither is Andrei. Still, in Chiang Rai we found the perfect mix for all of us: See Sky at Na-Rak-O. Located a bit outside the city, See Sky is in a wonderful location, in the middle of the nature. 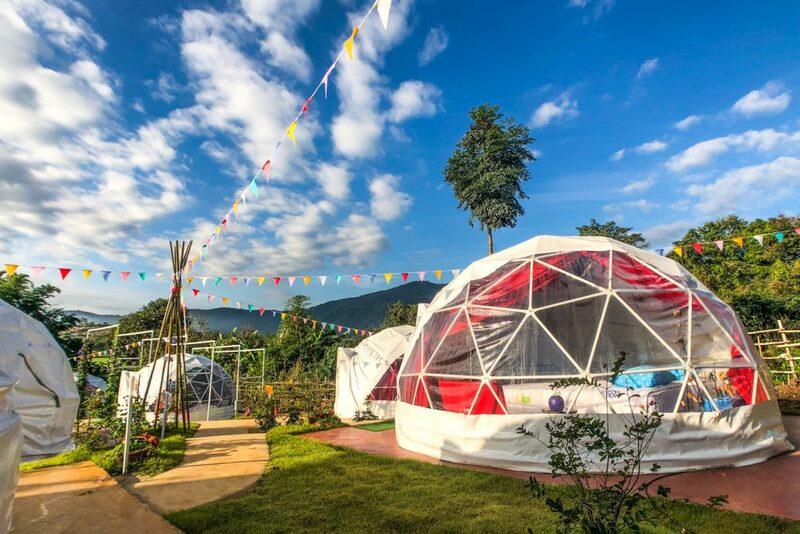 The sky domes are cozy and comfortable, similar with a tiny hotel room. Eric was very excited of the idea of sleeping there and woke up in the morning full of energy to explore the large outdoor area. One of the highlights was the pineapple garden located right next to our dome! If you don’t fancy the domes, See Sky also feature nice family rooms, just perfect for larger groups. 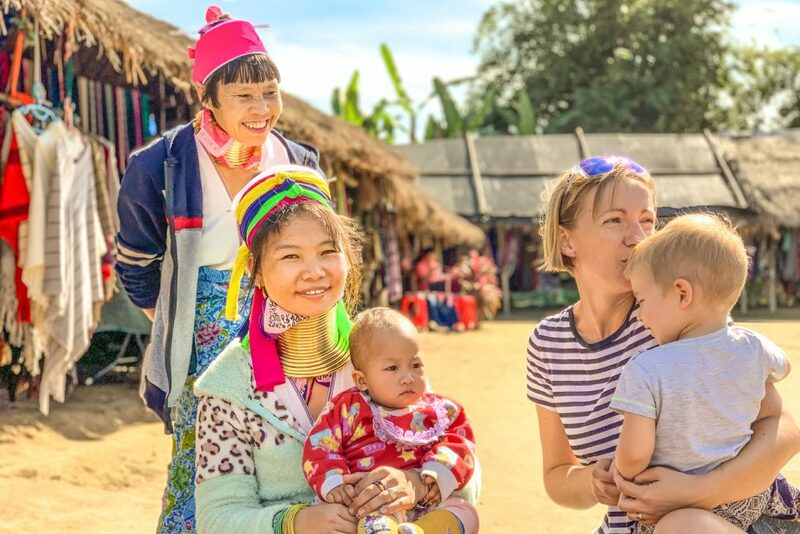 Disclosure: We were the guests of Phra Singh Village and See Sky at Na Rak O during our stay in Chinag Mai and Chinag Rai. All the opinions expressed here are our own.